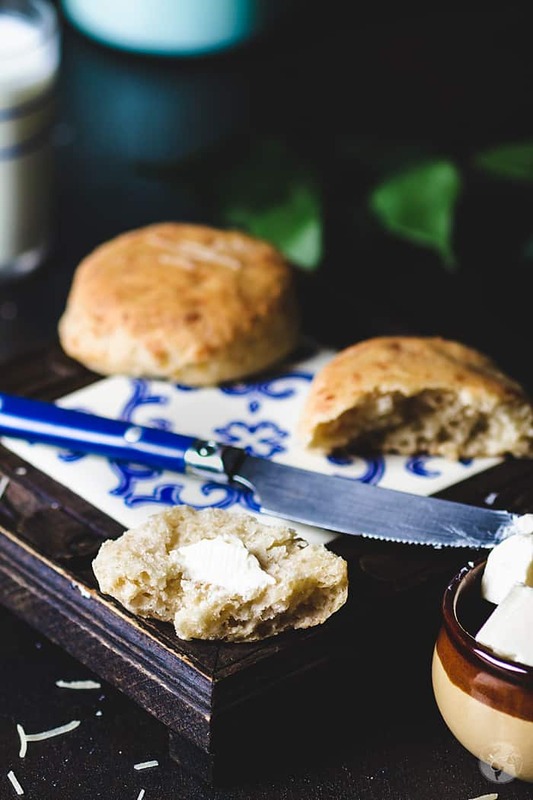 A tasty addition to any dinner, these homemade buttermilk biscuits are delicious on their own or with a smear of butter. Loaded with parmesan cheese and sesame seeds, they are tangy in taste, flaky, and tender. When you don’t need a mixer, yeast, or much time to bake biscuits, why would you ever buy boxed mix? Besides, you can play with different flavors, adding herbs and cheeses you like for a fraction of the cost. I adapted this delicious recipe from the More Home Cooking book by Laurie Colwin. Sadly, it’ll take quite some time before I can make these buttermilk biscuits again. They were the last thing I made a week ago and the only thing since. Oh, friends, I’m heartbroken!  Exactly a week ago, my girl Baylie somehow broke her knee. I took her to the emergency vet the night I baked these biscuits. The prognosis was grim: a 14-yo dog with kidney disease wouldn’t survive the surgery or the long recovery. I took Baylie home, hoping the pain pills and anti-inflammatory meds will help, and she’d learn to limp and come around, but by the next day, we knew there was no helping her. We decided to take her out of her misery, and we said our goodbyes (only six weeks after we lost our other dog, Lacey). It was the hardest thing I had to do in my life, and I don’t say that lightly. Escaping the war seems like a piece of cake in comparison. I don’t want this post to be sad. Baylie was the best, most gentle dog in the whole world, contrary to popular belief that pits are vicious, and I want to celebrate her life. I picked myself up today to share this savory biscuit recipe with you. Talking about her helps me healing. Tomorrow, I might even go back to my kitchen. 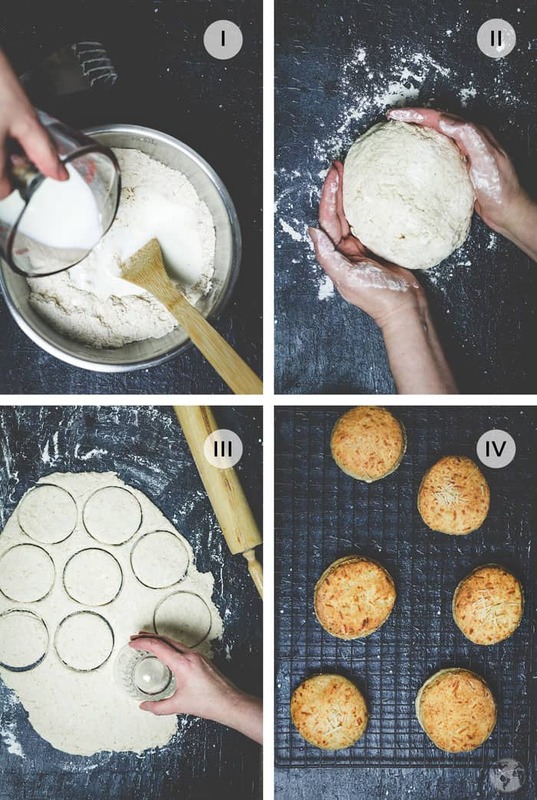 CAN I FREEZE THESE PARMESAN AND SESAME BUTTERMILK BISCUITS? Of course! There are two different routes you can take. Freeze them before or after baking. Before baking: Place the cut, unbaked biscuits to a parchment lined cookie sheet. Cover lightly with plastic wrap and place the cookie sheet in the freezer until the biscuits are frozen solid. Place them in a resealable freezer bag and keep frozen until needed, or for up to 3 months. After baking: Let cool baked biscuits on a wire rack completely. Wrap them tightly in heavy-duty aluminum foil or plastic wrap, and pack in freezer bags. 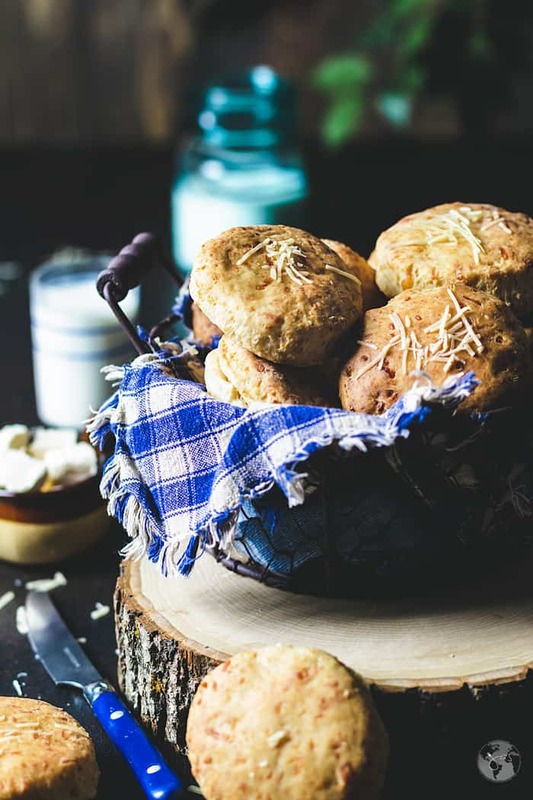 CAN I MAKE BUTTERMILK BISCUITS AHEAD OF TIME? The biscuits are easy and quick to make. I do not recommend mixing all the ingredients ahead of time, because we are using baking powder and not yeast and they’ll lose a lot of the leavening power. You can, however, mix the dry ingredients and cut the butter into them, and then add the buttermilk right before you want to bake them. 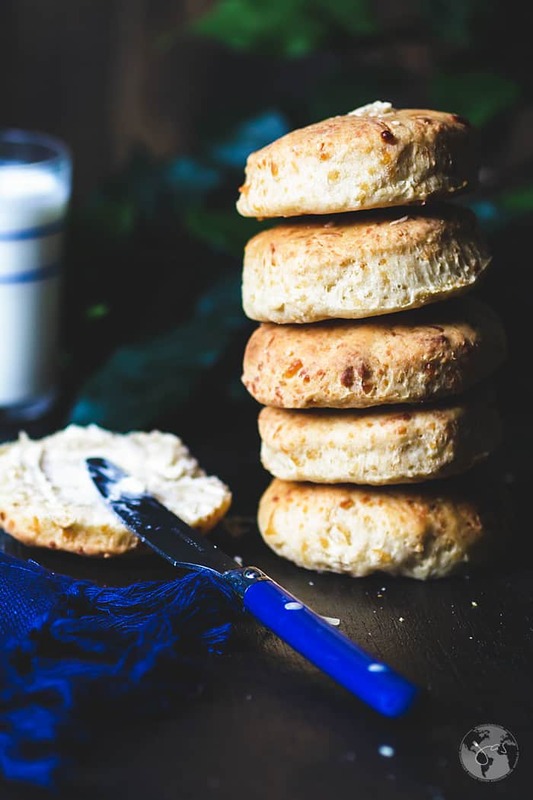 HOW LONG WILL BUTTERMILK BISCUITS LAST? 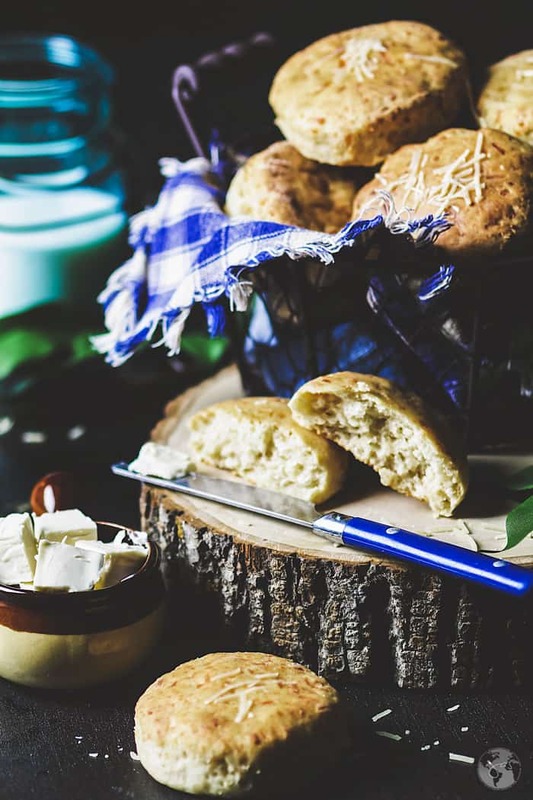 Freshly baked biscuits will keep well for about one week in the fridge covered with plastic wrap or placed in a plastic bag to prevent drying out. HOW TO MAKE PARMESAN SESAME BUTTERMILK BISCUITS? You easily can make these flavorful biscuits in about 30 minutes. *Details and printable recipe card below. Rub in the cold butter and add the cheese and sesame seeds. Stir in the buttermilk and mix until moist. Gently knead the dough until just combined, roll it out and cut with a drinking glass or cookie cutter. Bake in the preheated oven for 12 to 15 minutes. Serve hot or at room temperature. You can add a dash of cayenne pepper to the biscuits (as per Laurie’s original recipe) if you like a little kick (I wasn’t fond of it though). Replace parmesan with shredded cheddar cheese for a milder flavor. To toast sesame seeds, place them in a dry skillet over medium heat for 3-5 minutes or until lightly browned, stirring occasionally. Make sure your baking powder is fresh as it is essential to get a good rise in the biscuits. You can make the biscuits big and flat or small and puffy. It’s up to you and the size of the cutter you have. Substitute buttermilk with a mix of milk and yogurt. For one cup buttermilk, stir 1/4 cup milk into 3/4 cup plain yogurt. Work gently with your dough, don’t overwork it. Fold the dough at least three times and up to six times to ensure they are super flaky. Don’t make the same mistake I did and twist your cutter when cutting the biscuits. It seals off the edges, and they won’t rise as high. You can flour the cutter, so the dough doesn’t stick to it. These easy Parmesan and Sesame Buttermilk Biscuits are perfect hot out of the oven as an accompaniment to any meal, or to eat on their own! Preheat oven to 425 degrees Fahrenheit. Line a large baking sheet with parchment paper or a silicone mat and set aside. In a large mixing bowl, sift together 2 cups of flour with a tablespoon of baking powder. Add in the 2 tablespoons of cubed cold butter and rub, or cut into the flour using a pastry cutter or a food processor until the mixture resembles large crumbs. Mix in 1 cup grated parmesan and a tablespoon of toasted sesame seeds. Add 1 1/4 cups buttermilk and stir until moistened and the mixture forms a dough. Transfer dough onto a lightly floured clean surface and gently knead it with your hands just until dough holds together. Pat the dough and fold over a few times. Pat or roll out the dough to about 1/2-inch thick and cut, using a biscuit/cookie cutter or a drinking glass. Continue to gather any scrap pieces of dough, patting it back down to 1/2-inch thickness, and cutting it until you have 12 biscuits. Arrange on the prepared cookie sheet and bake for 12 to 15 minutes or until lightly golden brown. Remove from the oven and brush with melted butter and sprinkle with parmesan cheese if desired. Enjoy! You can add a dash of cayenne pepper to the biscuits (as per Laurie's original recipe) if you like a little kick (I wasn't fond of it though). You can make the biscuits big and flat or small and puffy. It's up to you and the size of the cutter you have. Work gently with your dough, don't overwork it. Don't make the same mistake I did and twist your cutter when cutting the biscuits. It seals off the edges, and they won't rise as high. You can flour the cutter, so the dough doesn't stick to it.